There are any number of reasons why you might want to capture a shot of the iPad's screen. Perhaps you want to save your cool drawing in Draw Something? Or perhaps you want to brag about your score in Candy Crush Saga? Or maybe you just thought of a cool meme? The iPad doesn't have a print screen button, but it is still amazingly easy to capture a screenshot of the iPad's display. First, hold down the iPad Home Button. This is the round button below the screen. Keep holding it down until you complete step #2. 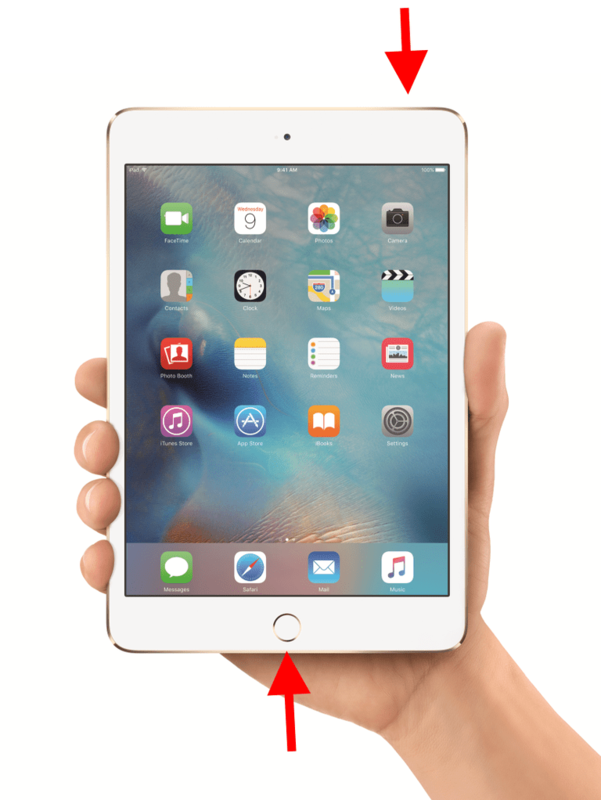 While holding down the home button, press the Sleep/Wake button on the top-right rim of the iPad. When you hold the home button and the sleep/wake button at the same time, the iPad will capture an image of the screen. You will see a flash on your screen signaling the iPad's screen was captured. Where Does the Screenshot Go? Once you've captured the screen, you can find the image within the Photos app. The screen's image is saved in the same place any picture you take with the iPad's camera. Once you launch the Photos app, you can find the image in the "Albums" section under "Camera Roll" or in the "Screenshots" album, which is automatically created after you capture your first screenshot. There are a number of ways you can send the image of your screen to your friends. You can text the image, send it in an email message or simply post it on Facebook. First, launch the Photos app and find the screenshot. As mentioned above, the screenshot will be in the Camera Roll album and in the Screenshots album. When you find the screenshot, tap on it to select it. With the screenshot selected, tap the Share button. This is the button at the top of the screen that looks like a square with an arrow sticking out the top. After you tap the Share button, some options will show up on the screen. You can send the screenshot as a text message, in an email message or save to iCloud Photo Sharing. You can also share the photo to Twitter or Facebook. On the second row of buttons, you will have the option to Print the screenshot. What Are Some Good Uses For Screenshots? Capture a Photo From the Web. You can download many photos from the web by tapping your finger on the photo and holding it down until a menu appears with a download option. However, not every image on the web will allow you to use this trick. Even if you can't download the image, you can still take a screenshot of it to get it into your camera roll. Use the pinch-to-zoom gesture to zoom in on the image until it looks full screen on your iPad before snapping the screenshot. Capture a Photo From an App. The same trick will also work in apps. The screenshot function is a feature of the iPad, not a feature within an app, so it will work on all apps. So no matter if you are on Instagram or Facebook or any other app, you can always take a screenshot. Save a Tweet or Facebook Update for Posterity. Have you ever come across a status update and were fairly certain the author would delete it in the future? The screenshot function is a great way to save a record of a status updates whether it is Twitter, Instagram, Tumblr or any other social media platform.